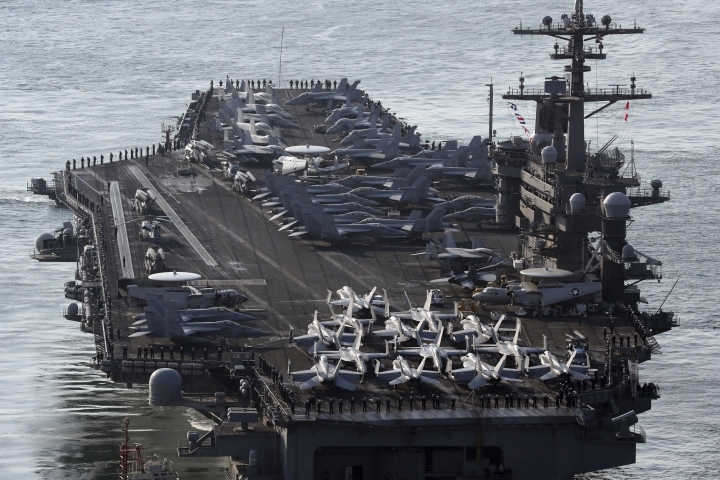 The Pentagon says A U.S. Navy aircraft carrier strike group is departing the South China Sea to provide a physical presence near the Korean Peninsula. The U.S. Pacific Command directed the carrier group to sail north to the western Pacific after departing Singapore on Saturday, according to a Navy news release. The strike group includes the aircraft carrier USS Carl Vinson, with support from several missile destroyers and missile cruisers. Deployed from San Diego to the western Pacific since Jan. 5, the strike group has participated in numerous exercises with the Japan Maritime Self Defense Force and Republic of Korea Navy, various maritime security initiatives, and routine patrol operations in the South China Sea. Its activities in the South China Sea were considered a message to Beijing about Washington's determination to maintain its presence in the disputed waters. Beijing said it was well aware of the strike group's activities and reiterated its stance that the U.S. presence in the area would only increase tensions at a time when claimants are working toward a long-awaited code of conduct aiming to reduce the potential for conflicts. China's sole aircraft carrier, the Liaoning, also held exercises in the South China Sea from late 2016 to the beginning of this year, concluding them by sailing through the Taiwan Strait that divides China from the island it claims as its own territory. China is also believed to be close to launching its first entirely-home built aircraft carrier. Philippine President Rodrigo Duterte has ordered the military to occupy and fortify all Philippine-held islands in the South China Sea to assert the country's claims in an apparent response to China's moves to cement its control over its claims. "We tried to be friends with everybody but we have to maintain our jurisdiction now, at least the areas under our control," Duterte said during a visit to a military camp in western Palawan province. Duterte said he has ordered the armed forces to occupy and place Philippine flags on all islands, reefs and shoals controlled by the Philippines. Bunkers and other infrastructure for habitation must be built on nine or 10 islands, he said. It was unclear how Duterte's order can be executed. Some of the tiny reefs and outcrops would need expensive and logistically difficult reclamation work before structures could be built on them. Duterte said he may visit one of the islands, Pag-asa, to raise the Philippine flag on Independence Day. He said money has been budgeted to repair the runway on Pag-asa, home to a small fishing community and Filipino troops. Duterte has worked to mend ties with China that were strained under his predecessor over the territorial disputes. He paired that approach by attacking the U.S. for its policies in Asia and insulting former president Barack Obama for having criticized his bloody anti-drugs campaign. However, his administration now appears to be avoiding frictions with the U.S. while taking a more wary approach to Beijing. Vessels from China's coast guard are nearly constantly on station at the Luconia Shoals off the coast of Malaysia's Sarawak State on the island of Borneo, according to the Asia Maritime Transparency Initiative under the Center for Strategic and International Studies. The presence of the vessels "speaks to Beijing's determination to establish administrative control throughout the nine-dash line," the report said, referring to China's roughly drawn outline of its South China Sea territorial claim. The reefs lie between the Spratly chain, where China has been building islands out of reefs and equipping them with airstrips and other military installations, and James Shoal, which Beijing considers the southernmost extent of its territory. The James and Luconia shoals are underwater at high-tide and so cannot be claimed as territory. The center recorded the presence of coast guard vessels at the shoal beginning from September 2013. Malaysia sent one of its coast guard ships to monitor the presence of the Chinese in January, but its vessels are outclassed by the much larger Chinese vessels. Despite operating within 4 nautical miles (7 kilometers) of each other, there have been no reported confrontations between the vessels, it said. During a visit to Beijing by Malaysian Prime Minister Najib Razak to Beijing in November, the two countries said their navies would cooperate more in the South China Sea, in what was seen as a new attempt by Beijing to dilute U.S. influence in the area. That included the purchase by Malaysia of four Chinese littoral patrol boats. INDONESIA DESTROYS FOREIGN VESSELS CAUGHT FISHING ILLEGALLY IN ITS WATERS. Indonesian authorities destroyed 81 foreign ships at the start of April after seizing the vessels for fishing illegally in the country's waters. The world's largest archipelago nation has taken a tough stance against illegal fishing since President Joko "Jokowi" Widodo took office in 2014. Authorities have sunk 317 foreign vessels since then, including the most recent. Most of the vessels were from Vietnam, the Philippines, Malaysia and Thailand. Indonesia was upholding its sovereignty and combating illegal fishing, said Susi Pudjiastuti, the minister of Maritime Affairs and Fisheries who witnessed the sinking of two ships in the port of Ambon in Maluku province. "We hope Sino (the name of one of the ships) is the symbol of our victory against poaching after years of defeat, especially in eastern Indonesia," Pudjiastuti said. She expressed hope that the action would deter poachers. Pudjiastuti declared a fishing moratorium for foreign vessels immediately after taking office. "The state's sovereignty has to be upheld." Associated Press writer Teresa Cerojano contributed to this report from Manila, Philippines.